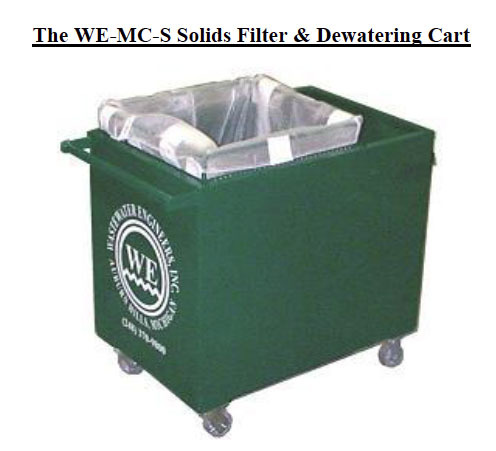 The WE-MC-S solids filter & dewatering cart is a unit intended for the separation of gross solids from a waste stream. Typically the WE-MC-S unit is used in conjunction with a cone bottomed settling tank. These units are constructed of carbon steel and have castor wheels. The cart is fitted with a perforated inset basket. A poly insert bag is used to line the perforated basket and provide filtration and an onboard float activated auto electrical sump pump is used to remove the clarified water. WE-MC-S Carbon steel constructed cart and basket. 36’’L x 24’’W x 38’’H Carbon steel cart, basket, auto pump, & (1) poly insert bag.